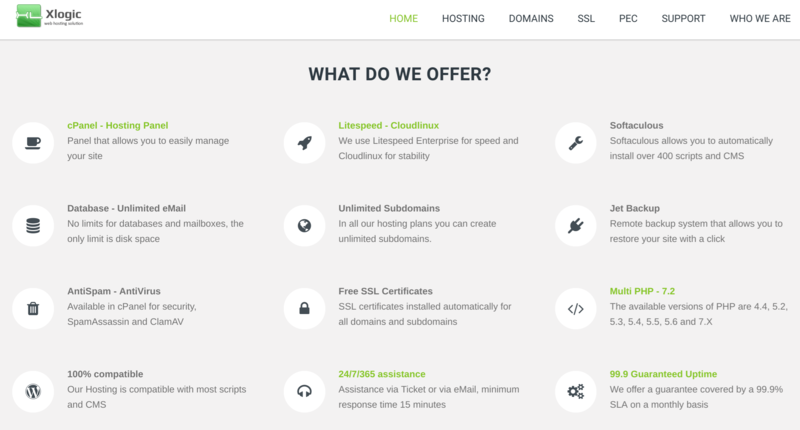 Xlogic Review 2019: Is Xlogic a Good Hosting? Italy-based Xlogic has been in business since 2011. Its upper tier plans are expensive, but the base plan is surprisingly feature-packed with decent resource allocations. Xlogic was founded in 2011 and has its headquarters in Collegno, Italy. With more than 180 five-star reviews on independent review website Trust Pilot, it appears to be a popular hosting provider. Xlogic’s modern website should be switchable between the Italian, English, and Spanish languages, but the language switching doesn’t seem to work for me in Chrome, so the site stays in Italian. Beginner webmasters will be pleased to see the Sofaculous one-click installer (for an unspecified number of programs), and experts will enjoy support for PHP version 7.2, phpMyAdmin, Cron jobs, Ruby on Rails, Perl, and CGI. There are several performance-enhancing features including LiteSpeed Web Server and Cloudflare CDN, and the CloudLinux operating system helps protect you from the effects of other hosted users. Xlogic has its servers colocated in data centers in England, Germany, and the Netherlands, which use Cisco switches and routers as well as Dell servers with Intel Xeon processors. All of the hosting plans use SSD storage for disk read/write speeds up to ten times faster than traditional HDD. There’s a high uptime guarantee at 99.99%, but it’s not backed by an SLA as far as I can see. Since Xlogic’s feature-packed plans provide generous resource allocations, it’s not surprising that the prices are high. However, if you need less than 16 GB SSD storage and fewer than 5 domains (which is more than enough for most everyday webmasters), the base plan is good value for money. A free SSL certificate is always included, but you will need to purchase a domain name or pay to transfer your existing domain to Xlogic. 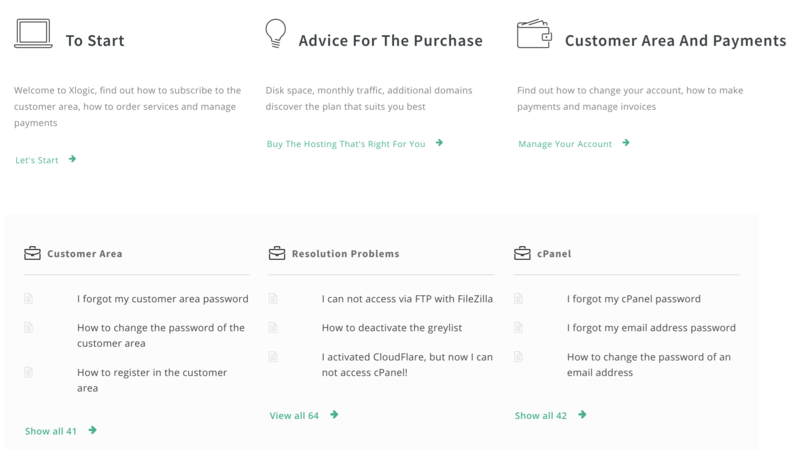 You can only purchase plans on one-year terms, which is quite restrictive compared to many shared hosting companies. A personal gripe of mine is the number of paid add-ons in the checkout process. I don’t mind paying extra for additional storage, but I believe that backups and website transfers should always be included. Customer service can be obtained by email, live chat, and tickets. Tickets should be dealt with within 15 minutes, but – despite the support being advertised as 24/7 – I saw that the live chat was offline several times during business hours. I never received a reply when I tried to contact customer service via the offline chat window on a weekday morning. Xlogic is proud to offer “fast hosting” with a series of performance-enhancing features. Its upper tier plans are overly expensive, but you can get a good deal on a base plan if you’re comfortable with less than 16 GB disk space. Get high-performance feature-packed base hosting plan from Xlogic! Wondering how Xlogic stacks up against other Web Hosting companies? Enter any other Web Hosting company and we will give you a side-by-side comparison.